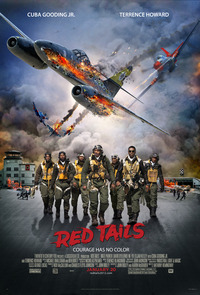 “Red Tails,” a Lucasfilm production, will be released in theaters nationwide on Jan. 20. RIVERSIDE, Calif. – “Red Tails,” a feature film scheduled for release on Jan. 20, depicts the heroism and skill of the African-American pilots and crew members who battled segregation on the ground as they challenged Germany’s aces in the air during World War II. Those aviators, known as the Tuskegee Airmen, went on to become judges, university presidents, teachers, architects, engineers, physicians, actors, scientists, and musicians. Documents and artifacts illuminating the careers of many of those pilots and crews are preserved in the Tuskegee Airmen Archive at the University of California, Riverside. Before shooting on the Lucasfilm Ltd. production started in Europe, several actors auditioning for parts in the film visited the UCR archive to learn more about the original Tuskegee Airmen they hoped to portray, according to University Librarian Ruth Jackson. Photographs from the archive were used in preparing for the production’s release activities, and the archive responded to requests for contact information for the filming of the DVD documentary film about the Tuskegee Airmen that will be released simultaneously. “The emphasis of our archive is to collect not only the military history but the history of their personal lives as well,” Jackson said of the archive that was established in 2005. The university also hosts an annual celebration to honor the airmen and women who were a part of the famed Tuskegee Experience. The graduates of the program, which trained the first African-American pilots between 1943 and 1945, established an enviable record during World War II. “Red Tails” was written by John Ridley (“U Turn,” “Three Kings,” “Undercover Brother”), produced by George Lucas (“Star Wars”), and stars Cuba Gooding Jr. (“Jerry Maguire,” “Radio”) , Terrence Howard (“Mr. Holland’s Opus,” “Ray”), and Bryan Cranston (“Breaking Bad,” “Malcolm in the Middle”). It tells the story of a crew of African-American pilots in the experimental Tuskegee training program who are given a chance in 1944 to demonstrate their skill, and their courage, as the war in Europe takes its toll on Allied forces. Jackson said the archive receives inquiries from around the world for information about the Tuskegee Airmen. For example, a salvage team retrieving a plane that was shot down off the coast of Corsica in World War II contacted the UCR archive for a photo of the Tuskegee pilot. The university was able to provide a group photo that included the pilot. To date more than 80 donors have contributed papers, artifacts and historical records documenting the military careers and personal lives of dozens of Tuskegee Airmen, including Buford Johnson, who lives in Inland Southern California. Johnson was the chief mechanic for the three Tuskegee Airmen pilots who won the first “Top Gun” competition in 1949 made famous by the hit movie “Top Guns” starring Tom Cruise in 1986 and recently honored by the UCR archive at its annual celebration of the Tuskegee Airmen. The UCR archive chronicles personal papers, photographs, oral histories, newspaper clippings, books by and about the airmen, military records, and memorabilia. It is the largest archive in a U.S. public university chronicling the history of the Tuskegee Airmen and Women. For more information about the Tuskegee Airmen Archive at UC Riverside contact University Librarian Ruth Jackson at (951) 827-3221, ruth.jackson@ucr.edu; or Assistant Archivist Eric Milenkiewicz at (951) 827-3233, Eric.Milenkiewicz@UCR.edu.